The perfect wedding ring that will be one of the most memorable moments of your love. This 10k white gold engagement/promise ring features 20 diamond stones. Individually hand polished to a lasting high sheen polish finish. This ring is both of unsurpassed quality and impressive design. Give the special woman in your life a gift that represents your fidelity and your lifetime together. A graceful, elegant design that proudly proclaims your commitment, this ring will both thrill and delight her. This simple ring band will definitely be a perfect fit for your lady. Made from the finest quality materials, this handcrafted gold ring is studded with 20 diamond stones. 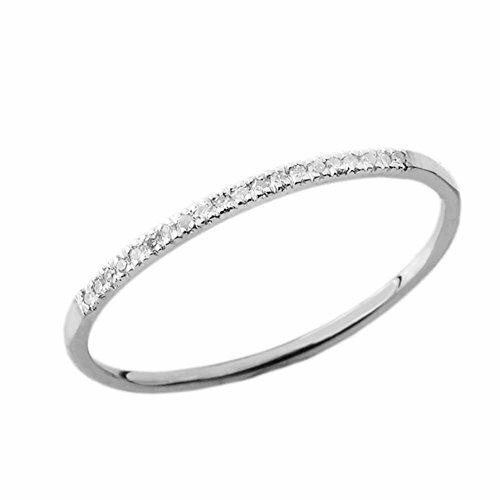 Finely crafted with authentic 10 karat white gold in perfect polished finish. comes with free special gift packaging perfect for Anniversary, Birthday, Valentines day, or any occasions for wife, fiancee, girlfriend, sister, etc. or for one's self. If you have any questions about this product by Dainty Engagement and Proposal Diamond, contact us by completing and submitting the form below. If you are looking for a specif part number, please include it with your message.